Women rally at Freedom Plaza during the Women's March in Washington, Jan. 19, 2019. Participants walk to the Ontario provincial legislature during the Women's March in a -22 Celsius (8 Fahrenheit) wind chill snowstorm in Toronto, Ontario, Jan. 19, 2019. ​On Trump’s first full day in office, hundreds of thousands of women descended on Washington in a display of popular opposition to the new administration and its policies. Sister marches were held in more than 600 locations in the U.S. and around the globe in solidarity with the marchers in Washington. 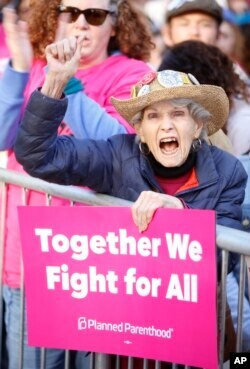 A demonstrator expresses her support for Planned Parenthood during the Women's March in Los Angeles, Jan. 19, 2019. 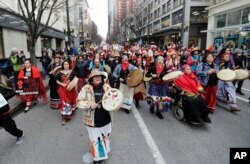 Native American drummers sing as they help lead the Women's March in Seattle, Jan. 19, 2019. 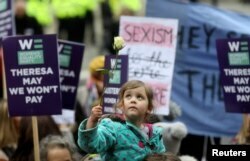 A girl holds a rose as protesters take part in the Women's March calling for equality, justice and an end to austerity in London, Jan. 19, 2019. 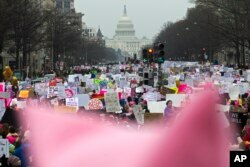 With a pink hat in the foreground, demonstrators march on Pennsylvania Avenue during the Women's March in Washington, Jan. 19, 2019.